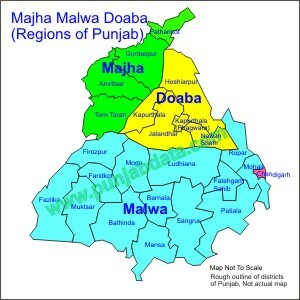 Punjab state is divided into three major regions Majha, Malwa and Doaba. This division of Punjab is basically due to the rivers Sutlej (or Satluj) and Beas flowing through the land of Punjab. In the historical times, it was not easy to cross the rivers and hence the areas divided by rivers were considered as separate regions. The regions were often ruled by different rulers or kings. The interaction between the people living in these geographically separated areas was limited. Due to this, there is a difference between the language and culture of the people living in these regions. Note that the regions Malwa, Majha and Doaba span over the parts of historic Punjab region which includes today's Punjab (India), Haryana, Himachal Prades and Punjab (Pakistan), but this article will mainly focus on the details that are relevant to today's state of Punjab in India. NOTE: There is a Malwa Plateau region in the central part of India, which occupies some parts of Madhya Pradesh and Rajasthan. When we are talking about India, the word Malwa mainly refers to that region and it has no relation with the Malwa region of Punjab. Powadh (or Poadh or Puadh) is another major region of Punjab. Powadhi dialect of Punjabi language, which is a mix of Malwai Punjabi and Haryanvi, is spoken in this region. Powadh is sometimes not considered as a separate region and this area is mostly included in the Malwa region of Punjab. The Punjabi speaking area near the Ghaggar river, mostly adjacent to Chandigarh is considered part of Powadh region. It includes parts of Patiala, Mohali and Ropar districts of Punjab and Panchkula and Ambala districts in Haryana.